The Illustration Arts Fest at LaSalle may be over but the fest continues as part of the Singapore Writers Festival over this coming weekend. I’ve been interviewing the foreign guests, but this week I like to feature our homegrown talent, Weng Pixin, or better known as Xin. I first encountered the work of the 32 year old artist about five years ago. She was then selling her own handmade toys from recycled materials in a shop, Doinky Doodles, which she opened in 2008 along Bali Lane (an earlier incarnation was Maki Squarepatch in 2006). She was also teaching part time at LaSalle on how to draw comics. Xin is not a professional comic artist. 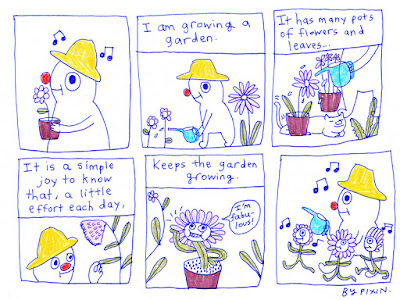 But she has created a few mini comics, which she sold at her shop and bookshops like Books Actually. At that point in time, she has made about 8 mini comics and 3 poster comics. Her mini comics are priced at $10 and above, double the price of most other mini comics in Singapore. 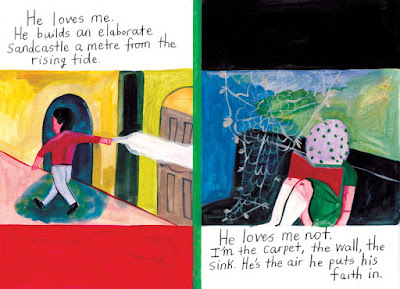 Xin’s comics are reminiscent of the work of Harvey Pekar and Jeffrey Brown. She seeks to emulate the emotional and intellectual intensity of the former but is closer to the latter’s lovelorn sappiness. Her major comics are the two-parter, Please To Meet You and I’ve Lost An Ocean, which detailed the fallout of her breakup with her boyfriend in 2006. 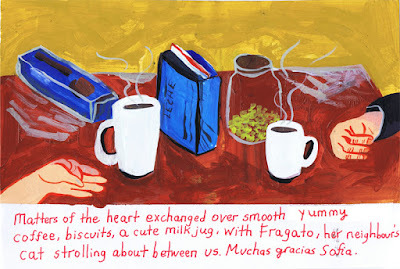 Xin described these two works as diary-entries, and doing these comics was meant to be therapeutic for her. In the afterword, she said she was advised by family and friends to not be overly edited. 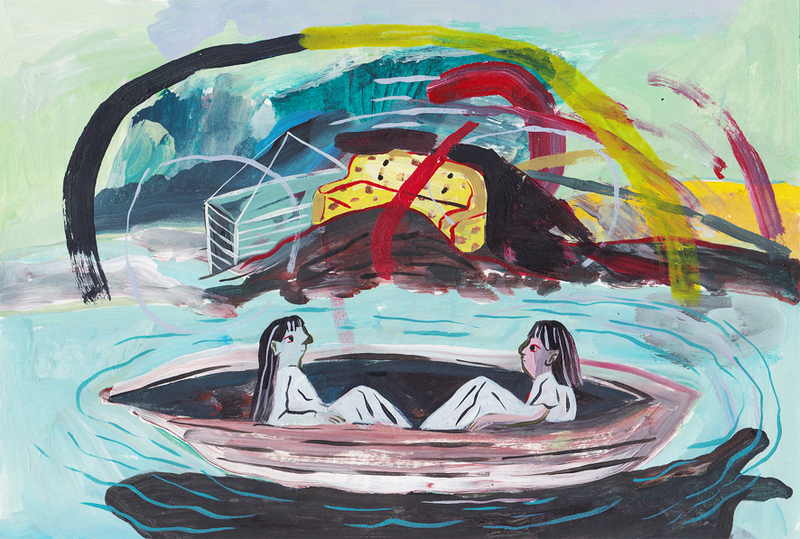 Thus, Xin’s comics falls within the category of what Hillary Chute described as reimagining trauma, whereby artists return literally to events to re-view them. The first book, Please To Meet You was a blow by blow account of the fallout. But the catharsis was incomplete. The second book, I’ve Lost An Ocean was more reflective. It took place immediately after the events of Please To Meet You – it showed how Xin picked herself up, recovered from the experience and reconciled with the breakup. She still described her boyfriend as kind and gentle even though she was dumped for no good reason. In this email interview, Xin’s answers were thoughtful and provided insights into her artistic processes and practice. The desire to build a community through art is a constant refrain in her replies. Xin has since closed down Doinky Doodles at the end of 2013 and has started a new workspace, Studio Why Not. What is your current art practice and what informs it? My current art practice involves teaching-&-facilitating art workshops mostly for children, engaging in community-based art projects and designing-&-facilitating art experientials for groups of individuals with specific goals in mind (the goals are often directed by the organizations I am working with). In terms of my personal art-making processes, I find that there has been a gradual shift, from my initial interest to create semi-fictional pieces reflecting themes of loss, change and transformations, to my more current interest, which carries themes of acceptance, courage and working with vulnerability. I feel my interest in expressing my responses to universal states, such as happiness, shame, pain, harmony…etc, are what generally informs my art processes, practices and interests. How would you describe yourself - an art maker of handmade objects, an art therapist or a comic artist? Yes, I think all of them apply to me in big and small ways. You graduated with a first class honours in Painting, Fine Arts from the LASALLE College of the Arts in 2004, and later returned to LASALLE to do a Masters in Art Therapy. What motivates you as an artist? What motivated me is…probably my belief that art is not an extra special something in life, and that art is very much part of our life. It is not restricted to scheduled moments in the theatre, galleries…, it is also not restricted to books, paintings and many other structure that art exists in and within (though those mediums are just part of where art takes its form in). Art is a form of communication in the broadest sense, be it in a verbal or nonverbal manner, or both. For me, seeing art in this way motivated me to do what I do, as an art-maker, art therapist and comic artist. Can you share with us My Thread, My Word, your communal sewing project? My Thread, My Word started because I found myself wanting to sew, but I was not motivated to do it on my own anymore (I did solo-sewing for close to 7 years!) I had completed my studies in art therapy and began work in a private psychotherapy clinic. Soon the idea of a communal sewing project came to mind. I wanted to…somehow (during my off days from work) be able to do something that brings people together through the art process that I enjoy very much, while also giving me the opportunity to sew. It is also connected to my belief that art is for everyone, that it is not about being in some hip venue making art (though I don’t mind that happening), but really- about the gathering of people in a comfortable space to make and sew some art together. When and why did you start doing comics? I started making comics sometime in 2006. The reason was pretty much to make sense of a heartbreak that was experienced as a very sudden and surprising thing, so naturally- that made it rather hard to sort of, digest, what just happened. I tried writing it out, like journal-entries really. Then when I found I could not put to words what was going on, I found myself drawing, to accompany my journal. As it looked like a huge mess, I thought to arrange them in boxes, which also helped provide a sequence or flow to how the words and pictures work together to tell my story. Prior to that, I had not read a single graphic novel in my life (I grew up more with cartoons and short-formed comics like Bill Watterson’s Calvin and Hobbes or Matt Groening’s Life in Hell). When I completed my comic, I knew I was not the only one who ever went through a heartbreak from breakups, and so decided to print it into a comic zine to sell at art markets. It was only then, where people started sharing information to me about graphic novelists, in a “hey, your work reminds me of so and so”, where I begin to check out graphic novels. Who/what are your influences for art in general and specifically for comics? My influences in art came from…as a teen, mainly Van Gogh and Picasso. Van Gogh for his passion and honesty (though looking back, I think he needed a lot more help than just making art), and Picasso for his playfulness and daringness. As an art student, I found myself more influenced by people I get to meet close-up (not through art books), because I feel seeing the artworks themselves made a much bigger impact on me. For me, as an art student- I was under the tutelage of Ye Shufang and Kelvin Tan during my studies. While Shufang encouraged me to check out works by overseas artists through books, which was wonderful, Kelvin recommended that I check out a senior of mine, Sia Joo Hiang, who was painting a few doors from where I was situated. I was pretty lucky to be able to check out her art space back when LASALLE College of the arts was situated at Goodman Road. Joo Hiang’s works made a big impact on me, because she painted the way, I feel, Marlene Dumas painted. I don’t mean stylistically, but in terms of energy: raw, unfiltered, bold…in a way that it stirs me emotionally. Looking back, I realized this energy of ‘stirring’ me was likely from their courage to be themselves and speak their minds. As an art student, this was refreshing because she was showing me that we can use art beyond representing something in our immediate surroundings. Joo Hiang’s art taught me how we can communicate ourselves in an, as unafraid a manner as possible. In my comics, I tried to do that as much as possible. What is your process like for your comics? Do you lay out your pages first by doing thumbnails or is it more free flowing - you just draw one panels after another? Do get someone to edit your work? The process for my comics has been a bit of a mixed bag. In some stories I wish to tell, I find it better to plan it out a bit, and in some others, I find free flowing works much better. Overall, I avoid too much planning such as sketching in detail where everything is to be within a panel or as a whole comic. This is due to the fact that I am sort of a messy art-maker in my paintings and drawings. In my sewing, I rarely plan at all. So I suppose I don’t quite work well with too much structure or certainty put into place. You have described Please To Meet You and I've Lost An Ocean as diary-entries. Are they meant to be therapeutic? They were meant to…help me understand what was going on inside my head. For some reasons, the heartbreak (then) hit me pretty hard and I was not able to string words together to make sense of my thoughts. I wanted to gather my thoughts so they could help me understand what is going on in order to know what I can do next. And in turns out- the pictures have to come in, to help me out. What functions do comics serve for the individual (for the artist and for the reader) and for society? I believe there is research stating that we survive as a human species by communicating and passing along our stories, our lived experiences, universal desires and wishes…and so on. In essence, it makes us feel less alone in our experiences and dilemmas. And comics is just one such way for stories to be created, passed along, for people (readers) to feel less alone and more connected to the community. Personally, I felt relieved when I found Gabrielle Bell’s works, because she captured a sense of mundaneness which I could relate to very much. I felt ‘less alone’ in experiencing my personal bouts of melancholia, and in turn- that helped relieved anxiety of ‘being the only one feeling or thinking this and that’. Why do you think most Singapore comics today are dealing with more about personal stories and issues? I believe we inherently, not only as Singaporeans, but just as people, want to belong. And a way to do that is to express ourselves, connect, and engage with others. Considering from a local context…there may be some reasons such as: (1) the availability of the internet, where you are exposed to a greater spectrum of others’ lives, from the wonky to the mundane, to the really interesting; (2) This may also be connected to the newer government’s approach where it is less authoritative than what my parents’ generation was used to. There is an expanded area for conversations, opinions and thoughts to be shared (more so compared to the past). With that, you have people feeling more comfortable expressing themselves than before; or (3) art schools and art colleges’ teaching approach, where the encouragement of one’s ideas (as a ground for art to take form) trumps the focus on honing techniques. What was the last comic you produced and any new ones coming out soon? The last comic produced was probably in 2015, where I completed a series of short-form comics, working along the themes of conversations with the subconscious (if subconscious manifested as a human being). A new one I am working on is a short blurb for Chicks on Comics project, a Buenos Aires-based comics collective, with a focus in supporting and encouraging women comic artists. Comics as art or art as comics - what do you think? I like to think it is comics as art as life. You are taking part in the SWF panel on Illustrating the Female Body. Is illustration a mode for feminist discourse? And what is the role of the woman artist in contemporary times? Yes, illustration is certainly a mode for feminist discourse. Art in all forms is a potential mode for feminist discourse, so long as it is communication that does not promote hate and divisiveness. Illustration in particular is powerful because of its usage in print media and online media. Considered from a local context, a woman artist can further utilise her capacity by using her art as a form of education and support for the younger generation, especially the girls. For example, I believe illustrations (or any other form of art…) that seek to capture a fuller spectrum of women’s lives, experiences and dreams, can be a great base to contribute to the feminist discourse. If an artist’s illustrations can help inspire a girl to feel less alone, help her think and dream big, I believe that makes illustration a wonderful modality for amazing things to take form.